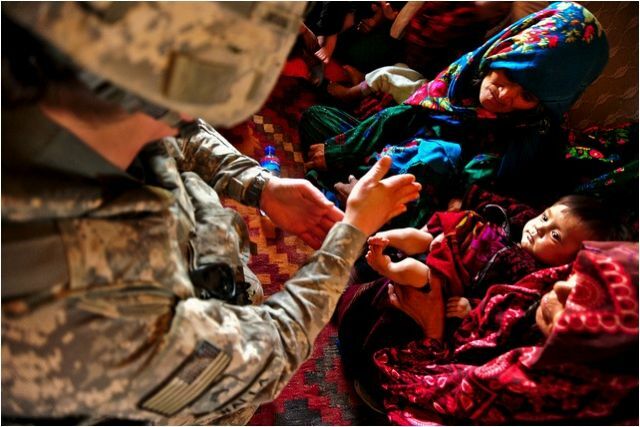 While providing medical aid to the people of the village of Narin in the Faryab province of Afghanistan, Staff Sgt. Jessica Walla, a medic with 3rd Battalion, 6th Field Artillery of the 10th Mountain Division’s 1st Brigade Combat Team, examines the feet and legs of a baby girl, on July 26, 2010. Photo via the US Army by Spc. Blair Neelands.